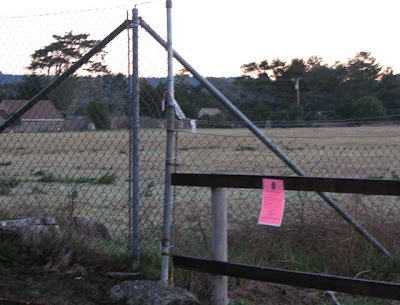 During my wandering I have been thinking about what's next for Fort Bragg. The commercial fishing days are over. The redwood mill has closed. Current hope is for tourist dollars but the way gas prices are going, good luck. During this morning's walk I happened upon this little pink sign at the east end of South Street. I think it may predict Fort Bragg's Future. And, mine! Proposed Development: New 2-story 102 unit residential care building for elderly. Project also includes (5) single story cottages for seniors, residents 55 years & older. Keep walking and they're never get yer. First Snowman in Fort Bragg!